Leaving a backwash of white foam behind it, the boat you will get on at the Köycegiz quay will take you on a trip on an extraordinary lake with delightful resting points. 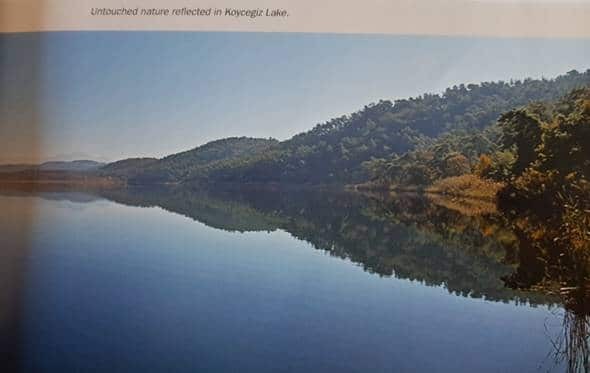 The second largest lake of the Aegean Region after Bafa with its surface of 5500 hectares, the Köycegiz Lake is situated in a depression that was a lagoon in old times. The mountainous terrain surrounding the lake that has alluvial plains to its northeast and southwest has a steep profile cleaved by deep valleys. The Turkish Pine woods stretching from the peaks to the lakeside render this virgin view even more impressive. The walls of the Medieval castle on the Hapishane (Prison) Island, which is one of the islands that are surrounded by reeds rising up from the lake’s surface like the miniature reflection of these mountains that are the south-western extensions of the Taurus mountains, establish a bridge between the past and the present. To the north of the lake, which is divided into two by the strait between Gedeva and Yanburun, lies the Köycegiz basin, to its north is the smaller Sultaniye Basin. 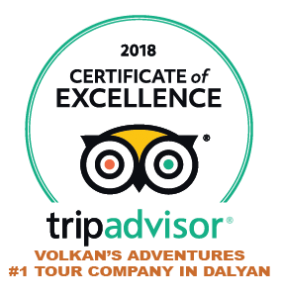 In the natural channel called Calbis in antiquity and the Dalyan River today, the deeper and surface currents that provide a two-way flow bring the lake’s waters to the sea and the seawater to the lake depending on many factors such as seasonal droughts, strong winds and high tide. For this reason the lake’s water is always a bit salty. 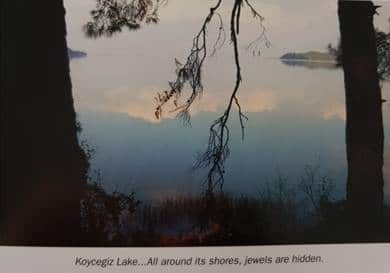 These lakes that are directly connected to the sea are called “legged lakes” and the fact that there are only seven legged lakes in the world increases the Köycegiz Lake’s importance significantly There are two important fault lines in the region. The Sultaniye thermal springs are located on the fault line to the south of the lake, which extends in a southeast to northeast direction. A branch departing from this fault line stretches from the channel entrance in the southcast to the Marmaralı basin and the thermal springs Velibey, Rıza Çavuş and Kokargirme (Gelgirme) are situated on it. On the second fault line that passes under the Köycegiz Lake, there is another thermal water spring situated the middle part of the south of the lake which releases its sulphurous waters directly to the lake. 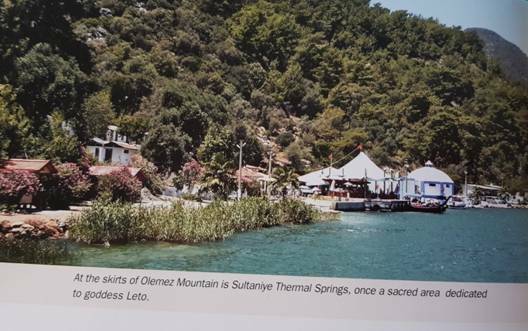 Both these thermal water sources and the fact that the depth of the lake reaches 70 metres at some places are indications that the seismic activities of the region still continue. The water of the lake, which is also rich in minerals due to the thermal water flow, offers ideal conditions for the procreation of flat planktons and zooplanktons. This wealth of planktons that changes the colour of the water from turquoise to green from time to time also provides nutrition for freshwater fishes as well as fishes such as gilthead seabreams, mullets and basses that pass through the Dalyan River into the lake in large shoals to spawn or young eels that go to the sea for procreation. The flesh of the fish, which develop and reach sexual maturity earlier compared to those of other regions thanks to this most suitable environment, achieve a very special taste. The still surface of the lake that reflects the surrounding beauty like a mirror in the mornings during summers starts to tremble due to a cool breeze that comes down from the peak of the mountains towards midday and produces gentle waves. 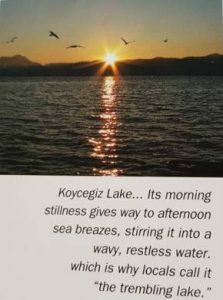 For this reason the Köyceğiz Lake was given various pleasant names such as “the trembling lake” and “the restless lake” by various travellers who, enchanted by the lake, stayed here for long periods. This periodic wind almost spontaneously brings small sailing boats skimming over the still water like hovering dragonflies.